One of 5 routes up to Mt. Tam's western peak. This climb is one of the 4 primary routes in Marin County to the top of Mt. Tamalpais. Mt. Tamalpais is the highest peak in the Marin County and has 2 peaks - the East Peak (2,574') and West Peak (2,563'). The white radar dome that sits upon Mt. Tam's slightly lower western peak is quite discernible from afar. An exceptionally scenic and unique riding opportunity is to ride from the Golden Gate Bridge to the top of Mt. Tam (see details at GGB page). Panoramic Highway to Pantoll Road: This is the least strenuous of the 3 segments to the top of Mt. Tam at 5.2 miles, 1,095’ at 3.1%. Along this route we initially have views of the West Peak of Mt. Tam, the distant Pacific Ocean, a brief glimpse of the white radar dome we will end just below, and finally wooded borders to the roadway. We end this segment at Pantoll Campground and Mt. Tamalpais State Park ​There is a Visitor Center here where information about the area and maps are gladly dispensed by the rangers. ​The second leg is up Pantoll Road from its intersection with Panoramic Hwy to Rock Springs Parking Area (staging area for many television commercial (often cars and trucks) shoots). Along this route we have great views down to the Pacific Ocean and near the top of Mt. Diablo, San Francisco Bay and San Francisco. This segment is 1.4 miles / 490' / 6.2%. ​The final leg is along Ridgecrest Blvd east and is the easiest and gives us more spectacular views of Mt. Diablo, San Francisco Bay and San Francisco. This segment ends as Ridgecrest "crests" just east of the radio dome atop Mt. Tam’s West Peak ant is 1.5 miles /510’ / 6.8%. This climb is one of the 4 primary routes in Marin County to the top of Mt. Tamalpais. Mt. 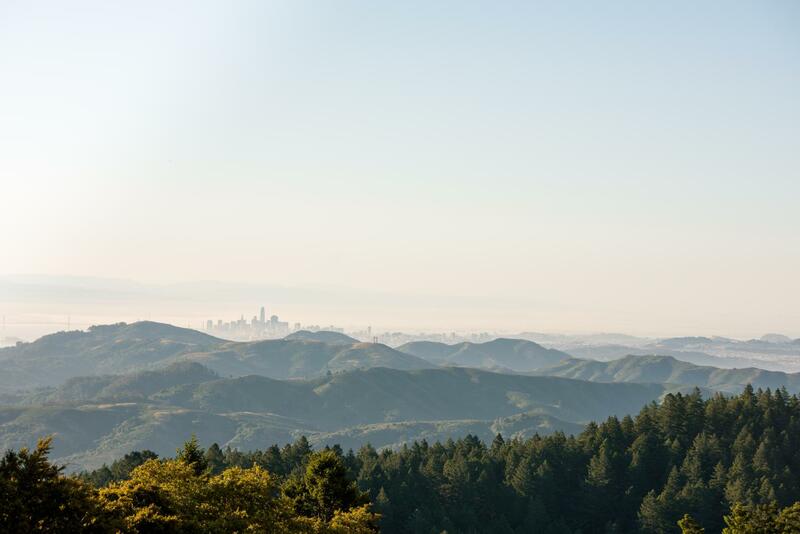 Tamalpais is the highest peak in the Marin County and has 2 peaks - the East Peak (2,574') and West Peak (2,563'). The white radar dome that sits upon Mt. Tam's slightly lower western peak is quite discernible from afar. An exceptionally scenic and unique riding opportunity is to ride from the Golden Gate Bridge to the top of Mt. Tam. Other climbs within 25 miles of this climb are Mt. Tam via Muir Woods, Mt. Tam via Panoramic Hwy North, Mt. Tam via Alpine Dam, Mt. Tam via Fairfax-Bolinas Road, Fairfax-Bolinas Road, Broderick Street, Lombard Street, Filbert Street, Romolo Street, and 22nd Street. Access these other climbs by clicking "Routes in Area" on the climb card above right.